Figure A39. Hindu Kush anomaly, interpreted as the Hindu Kush slab, with (horizontal) [vertical] cross sections through (A)[D] the UUP07 p-wave) and (B)[D] the combined SL2013 and S40RTS s-wave models at 470 km; C) the location of the modern geological record that we interpret to have formed during the subduction of the slab. A narrow, E-W trending, steeply north-dipping anomaly was described below the Hindu Kush region of North Pakistan, from deep earthquakes reaching 250 km depth (Pegler and Das, 1998; Pavlis and Das, 2000; Lister et al., 2008; Zhang et al., 2011) and seismic tomography shows it reaches a depth of ~600 km (Van der Voo et al., 1999b; Negredo et al., 2007; Li and van der Hilst, 2010; Replumaz et al., 2010b; Kufner et al., 2014) (Figure A39). The Hindu Kush anomaly is typically seen as subducted Indian plate lithosphere attached to continental crust of NW India (Negredo et al., 2007; Lister et al., 2008; Replumaz et al., 2010a; Kufner et al., 2016). This interpretation requires that India has been horizontally underthrust northward below the Sulaiman Lobe of Pakistan, south of the Hindu Kush, over a N-S distance of ~500 km to reach the location where the Hindu Kush slab dips steeply northward. 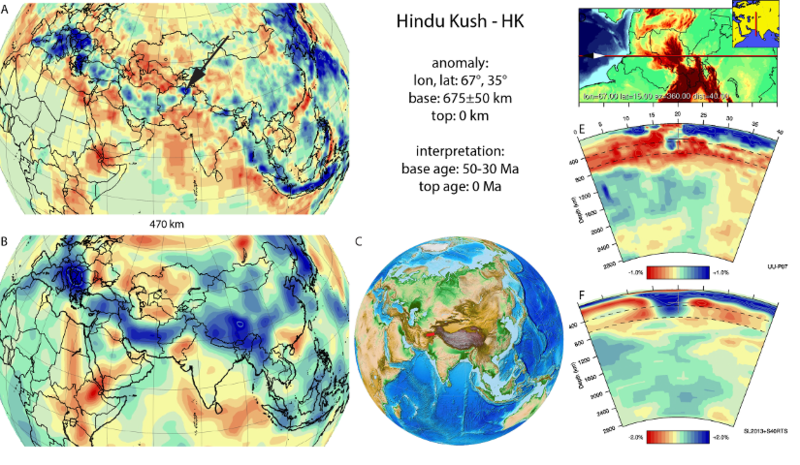 We may thus estimate the minimum age for the moment of subduction of the base of the Hindu Kush slab by reconstructing since when India and Asia have converged 1100 km (500 km northward underthrusting of India plus 600 km of slab length) at the longitude of the Hindu Kush slab, assuming no overriding plate shortening, i.e. 30 Ma according to the reconstruction of van Hinsbergen et al. (2011b). Recently, however, Kufner et al. (2014) suggested that the Hindu Kush slab may correspond to Asian lithosphere instead, since at depth the Hindu Kush slab cannot be distinguished from the Pamir slab. Gaina et al. (2015) developed a scenario assuming that the Hindu Kush slab is Asian, showing that it must have subducted between the Helmand Block of Afghanistan and the Tadjik depression. Taking the westward disappearance of the Hindu Kush slab into account, these authors proposed an (unconstrained) counterclockwise rotation of the Helmand block, keeping the Kandahar arc of the Afghan block contiguous with the Kohistan-Gangdese arc of Karakoram-Tibet. This scenario would provide ~600 km of Helmand-Tadjik convergence since ~50 Ma. Although speculative, this age may provide a maximum age for the base of the Hindu Kush slab. We allow a 50-30 Ma age range for the base of the Hindu Kush slab.